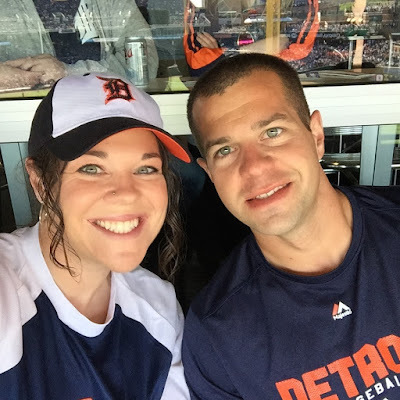 Runs for Cookies: VIP Tigers game! Yesterday was amazing! I wasn't really sure what to expect, but I was ridiculously excited to receive the invitation to the Tigers game and VIP reception for the Wins for Warriors race. First, Jerry and I went to Nathan's house for lunch before heading to Detroit. I've only been to my brother's house once, and that was right after he moved in--it's been a while! He told us we could bring Joey, and Joey could stay at his house with Bailey while we went to the game. When we got there, the dogs played in the yard while Nathan grilled chicken and we chatted. Nathan made grilled chicken Caesar salad wraps, which were amazing. After lunch, we drove to Detroit. We were instructed to get our tickets and go up to the suite at 2:30, and we got there at 1:30, so we decided to go to Cheli's for a drink. I just had diet Coke, because I've been really doing well at sticking with counting all my Points and staying on track. If I decided to have a beer, I wanted it to be at the game. Once we picked up our tickets, we made our way through Comerica Park to our suite--which should have been easy, but it was pretty much a maze of elevators and winding through different areas. When we got to the suite, we were the first ones there, other than the people who organized the reception. 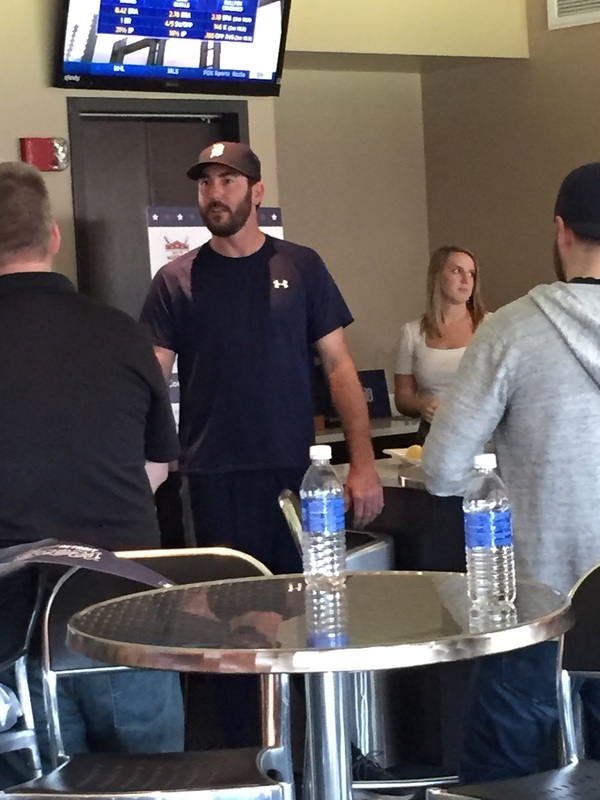 We made introductions, and then went outside to watch batting practice. 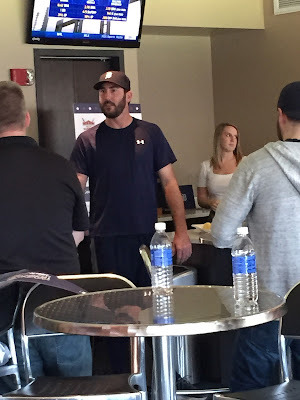 At around 3:15, Justin Verlander made an appearance. He thanked everyone for the work they'd done for Wins for Warriors (most of the people there helped put the fundraiser/race together; we were only there because we were the top fundraisers). He came around the room and shook hands with everyone to make introductions. We were told we couldn't do individual pictures or autographs, because of a time crunch, so I wasn't able to take a pic with him. After he left, we went outside and sat down for the game. Sitting in front of a suite is SO NICE. It was totally shaded, and we had a perfect view of the field. If there is one thing I can't stand about going to baseball games, it's sitting in the sun--I burn really easily, and I hate getting sweaty and sticky--so sitting in the shade was awesome. It kind of looks like Nathan has horns in this picture! The game wasn't too exciting. 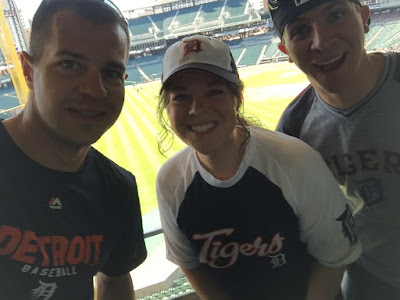 The most exciting thing to happen was actually when Houston made a triple play--I've never seen a triple play in major league baseball, so to be there for that was fun (too bad it wasn't the Tigers who did it, though!). The Tigers ended up losing 3-2. I had been planning to eat a hamburger later in the game, but by the time I went to get one, they were gone. So I was absolutely starving by the time the game got over! I hadn't eaten anything since the wrap at Nathan's at noon, and the game got over at 7:00. It took us forever to get out of Detroit. What is usually a 40-ish minute drive ended up taking us nearly two hours, due to all the traffic getting out of the city. We dropped off Nathan and picked up Joey, and then stopped at Subway so I could grab a sub for dinner (at 9:00 pm). I even had enough points for a glass of wine when I got home! Katie, you look absolutely beautiful in these pictures. You're so inspiring, Katie. I can totally relate to the struggle of being somewhere like that and having all that stuff for the taking. Love reading your blog. You talk so well about the matter-of-fact daily struggle of losing and maintaining weight. Your post about the habits you formed when you were initially losing the weight makes so much sense and is a good reminder for anyone-do what works for you and stick to it. Katie, please tell me your secret. You are getting younger every year. ;) Great pictures! Great pictures! Looks like you guys had a blast. Way to stay on track!